Henry VIII of England (28 June 1491 – 28 January 1547) was the King of England from 1509 until his death. He was the second of the Tudor monarchs, following his father Henry VII of England to the throne. His break with the Pope and Roman Catholicism was the origin of the Anglican Church. In 1536, the Act of Union was passed under Henry's rule. This act had a long lasting effect on Wales as a nation. The Act of Union meant that Welsh people were forced to speak English and things such as road signs were translated into English. Henry is known to the popular imagination as a jovial but temperamental monarch. He is infamous for having been married six times. Two of his wives, Anne Boleyn and Catherine Howard, were executed for treason. His three children followed him to the throne of England. They were Mary I, Edward IV, and Elizabeth I.
Henry was a competent author and composer. He was said to have written the tune known as "Greensleeves". Shakespeare wrote a play about Henry. Henry has been depicted in movies several times, notably by Charles Laughton. Henry is buried at Windsor Castle. He was one of the sons of Henry VII Tudor and his wife Elizabeth of York. When his elder brother Arthur Tudor died in 1502, he became the heir to the English crown and he succeeded his father in 1509. The same year he married Catherine of Aragon, the daughter of the Catholic Monarchs Ferdinand II of Aragon and Isabella of Castile and the widow of his brother Arthur. Starting in 1515, Cardinal Thomas Wolsey became his minister. Henry VIII pursued an alliance with France and, in 1520, met with King Francis I, during talks at the Field of the Cloth of Gold (so named because the English and the French displayed their wealth there). But the alliance between France and England failed, and Henry VIII aligned with the Emperor Charles V.
Henry VIII established the Protestant Church of England after a quarrel with the Pope. In 1529, Henry attempted to obtain the Pope's consent: he wanted to have his marriage with Catherine of Aragon annulled and to marry Anne Boleyn instead in order to have a male heir. The pope refused, and cardinal Wolsey (whose negotiations with the pope failed) was then dismissed in disgrace. In 1533, the Archbishop of Canterbury declared the divorce, and Henri VIII married Anne Boleyn. In 1534, he passed the Act of Supremacy, which meant that the king, not the pope, was the head of the church in England. He then forced all priests and bishops to accept him as the new leader. Anyone who refused was punished. The reign of Henri VIII became authoritarian: many executions took place, including those of two of his wives, Bishop John Fisher (1535), Ministers Thomas More (1535) and Thomas Cromwell (1540), and a good many more. In 1544, during a military campaign against France, England conquered the town of Boulogne, then the peace treaty with France was signed in 1546. 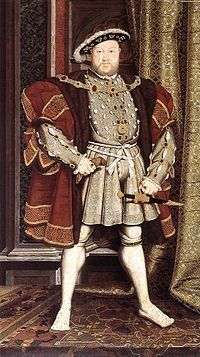 Henry VIII died in January 1547. 6 - 1543: Catherine Parr (1512–1548).